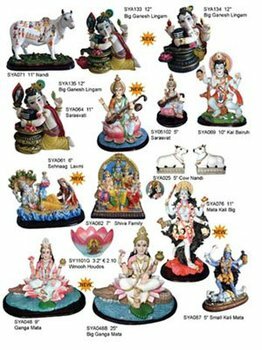 We have more than 500 styles of Hindu God Statues (Indian god, murtis items) , from 3" to 40". This is a new range with bright colors. And the price is cheaper. Please feel free to contact with us for more detals. We have Krishna, Ganesh, Ganesh with Lingam, Hanuman, Shiva, Baraji, Laxmi, Durga, Saraswati, Nandi, Kal Baireo, Shiva Family, Ganga, Kali, Narsing, OM, Deya for Divali) , Rodha Krishna, Surya Narayan (Seven Horse) , Minabai, Gaytrie etc. If you have any interesting, Please visit our website www.willken.com to find our contact details. Thank you.